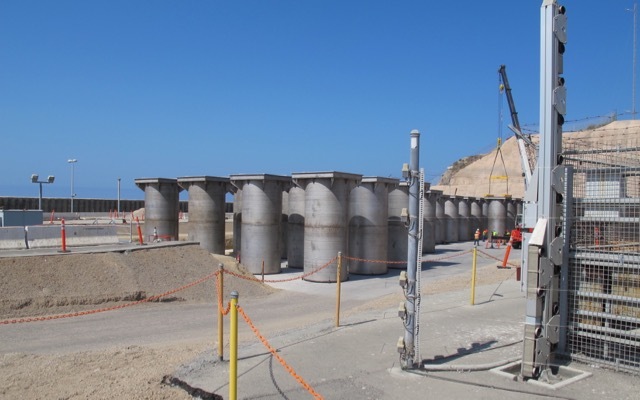 The recently deactivated San Onofre Nuclear Generating Station (SONGS) is back in the news lately as a plan to shift the remaining radioactive waste into dry cask storage systems moves forward. Critics are concerned that the onsite storage keeps the waste too close to the shoreline and two nearby fault lines. Other publications have highlighted the issue due to feared impacts on the famed waves around San Onofre (including world-class break Trestles) – no one likes to think about radioactive waste in the surf zone. Like much coastal industrial development, locating nuclear power plants along California’s coast wasn’t the most forward-thinking move. Lacking the ability to retroactively solve the problem by preventing it, we can nonetheless look at the current reality to press for the best of our limited options. The Surfrider Foundation is opposed to permanent or long-term storage of radioactive waste at the San Onofre site due to its proximity to the coastline, geological instability, and location within a densely populated area – nearly 8 million people reside in the vicinity, and it is directly adjacent to one of the United States’ busiest highways. We are actively engaged in advocating to remove the waste as quickly as possible. But simply hauling the radioactive waste to another location isn’t so easy. First, there is currently a backlog of spent waste in the United States. At SONGS, waste is slated to be stored on site until 2049, at which point the site operator, Southern California Edison (SCE) would transfer the material to the Federal Nuclear Regulatory Commission, (NRC) for offsite relocation if an approved location exists by then. No such facility currently exists. The Coastal Commission’s approval is being challenged in court by those who would like to see the waste removed from San Onofre more quickly and is scheduled to be heard by the San Diego Superior Court on April 14. If the court overturns the Coastal Commission’s approval, the spent fuel will remain in the cooling pools, where it would be less safe than in dry cask storage, since the pool storage depends on an active cooling system that is more at risk in an earthquake than the dry storage, which has a passive air-cooling system. Independent scientific organizations such as the Union of Concerned Scientists support this assessment. Surfrider staff members have also toured the SONGS facility, met with SCE staff to discuss the decommissioning process and have submitted comments regarding the scope of Environmental Impact Report (EIR) for decommissioning. Moving forward, we will continue to make our voices heard to move the nuclear material away from the bluffs of San Onofre as soon as feasibly possible. There is no question that there are better and safer locations for this material than along the densely populated coastline of earthquake-riddled southern California.